CYO Outdoor Ministry: St. Joe Sno! 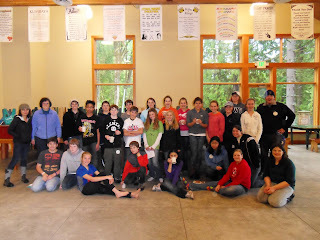 St. Joseph Snoqualmie came to Hamilton to frolic with the beavers and to learn important leadership skills. They roped up and climbed into the Vertical Playpen. The high ropes challenge allowed them to learn valuable leadership skills that will transfer from the outdoors to the everyday. Affirmations, “Cross the Line” and group affirmations allowed the group to grow closer to one another. After a Solo Hike St. Joe’s enjoyed some shelter from the rain with Hot Cocoa by the Fire in Discovery. The students had a chance to learn about leadership, each other, and most importantly, themselves at a fantastic day suspended high above the ground.